Peter Pan played by a woman: why? A history of casting the J.M. Barrie character. Why is Peter Pan Usually Played by a Woman? 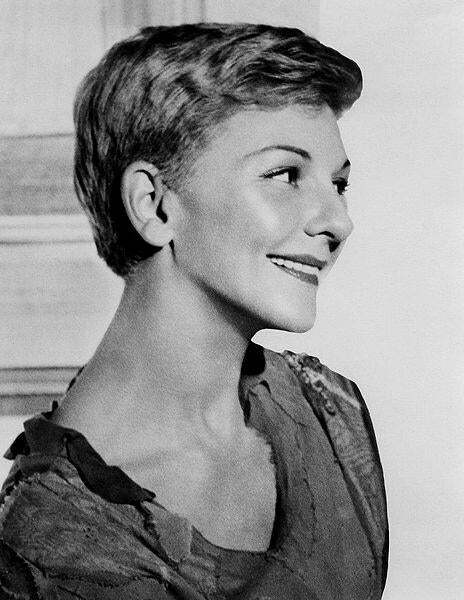 Mary Martin played Peter Pan in the first production of Jerome Robbins’ musical version. Will a singing, dancing male play Peter Pan in NBC’s latest attempt? Earlier this week, NBC announced plans to follow their hugely successful live version of The Sound of Music with a live adaptation of the musical version of Peter Pan. The choice seems like a no-brainer: Back in 1955, the network aired a live broadcast of the Broadway production starring Mary Martin to 65 million viewers, and that version has since become a beloved cultural institution through subsequent airings and home video. What is surprising is the suggested cast. NBC Entertainment’s chairman initially joked that he wants Miley Cyrus for the title role, then “hinted” that Peter Pan may be played by a male actor instead. This is a big deal to fans, since the character is nearly always played by a woman. Why have so few men stepped into the role of the eternally young boy? Initially, the interests of a producer, the logistics of casting, and even English law may have played a part. After that, it became tradition. In his 1979 book, J.M. Barrie and the Lost Boys: The Real Story Behind Peter Pan, English writer and director Andrew Birkin recounts the backstory for the first stage productions. Broadway producer Charles Frohman enthusiastically agreed to produce the play, and he made a couple of suggestions to the author. First, that it be titled, simply, Peter Pan; Barrie’s working title was The Great White Father, which is what Barrie has the Indians call Peter. (That phrase has uncertain origins but was—and is—used by some Native Americans to refer to white leaders.) Second, Frohman asked that, in America, the starring role of Peter be played by his protégé, Maude Adams. Frohman reasoned that a man would be wrong for the part, and if they cast a boy, the other children “would have to be scaled down in proportion.” English law prohibited the use of minors under 14 on stage after 9 p.m. So a woman it was. As Birkin explained to me via email, actresses Cecilia Loftus and Pauline Chase were cast in the seasons following the initial London production, and “even the 1924 silent movie had a girl—Betty Bronson—playing Peter.” From there, casting a woman for stage adaptations became the norm, and the majority of prominent productions have seen a female in the title role. Jerome Robbins’ musical version, a vehicle for Mary Martin, extended this tradition. Only one man, Jack Noseworthy, has played this version of Peter on Broadway, and he was an understudy in Jerome Robbins’ Broadway, an anthology of musical numbers from various shows (Charlotte d’Amboise was the principal Peter Pan). Only one song featured the impish boy character. There have been a few recent exceptions. Since the 1980s, the Royal Shakespeare Company has frequently employed adult male actors in its production of the play, and is currently doing so with actor Sam Swann. The Broadway and off-Broadway productions of the “prequel” to Barrie’s story, Peter and the Starcatcher, featured male actors. And in nearly every film adaptation, Peter has been played (or voiced) by a male. According to Birkin, Barrie always wished to see a boy play Peter on stage, though he never lived to see it occur. (In 1921, he tried to convince Charlie Chaplin to direct and star in a screen version. Chaplin considered it, but the film never came to fruition.) If NBC does wind up casting a male in the part, it will join those other exceptions as a fulfillment of the author’s wishes.